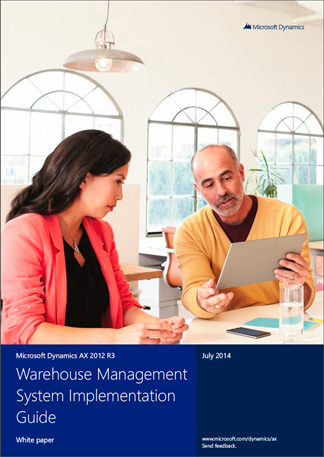 We’re glad to announce that the much awaited Warehouse Management System Implementation Guide for Microsoft Dynamics AX 2012 R3 is now available. You can download it here. Class materials and recorded sessions from training sessions in Warehouse Management System (WMS) and Transportation Management System (TMS) are also available on PartnerSource. The purpose of this guide is to provide functional and technical guidance to users who want to implement or use the Warehouse Management System in Microsoft Dynamics AX 2012 R3. The document walks you through a case study to implement warehouse management for a fictitious company, and contains explanations of concepts and descriptions of fields used in the warehouse form. Please note that this document is a supplement to the online help and information that’s available on TechNet, and does not contain documentation of every aspect of the Warehouse Management System. Additional resources and topics will be added in future versions of the document.